Gas prices adding up everywhere: Pizza, lawn mowing, where else? I hadn't called my favorite pizza place in a while because I've been making my own (it's cheaper and I've been trying to eat mostly organic food). But I was going out for the night, leaving my husband alone with three boys, so I called Rudy's and ordered the best deal: the $9.99 medium pepperoni pizza. "There's a $15 minimum now," said the voice on the other end, apologetically. "Gas is $4 a gallon, you know." I wasn't the only one to be hit with expenses due to rising gas prices (and what's worse, my husband didn't eat the $5.99 antipasto salad I ordered). Many businesses are starting to charge for delivery, or tacking fuel surcharges on top of existing prices. The Washington Post points to a $10 increase in the cost of a mowed lawn for one woman; off-the-charts fuel surcharges at grocery delivery service Peapod; and the surcharges to ship packages at UPS and FedEx, going up by a percentage point to 9.5% on July 6 thanks to the ever-rising cost of diesel. Green Daily wrote about a fuel surcharge for traffic violations that will go into effect in one Georgia town July 1. Naturally, not everyone is cool with the added on costs. Fuel surcharges billed after customers booked some cruises with Carnival and Royal Caribbean were paid back after the Florida attorney general had at the two companies. 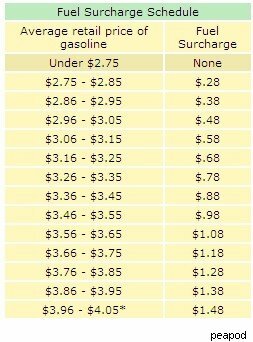 And Daniel Gross in this dated but still relevant Slate article calls fuel surcharges a "ripoff" that don't take into account the true costs to the company of the increase in fuel prices -- he says they're just a way to increase prices while appearing to be just a victim of market forces. Morally correct (or generally accepted accounting principles-following) or no, it's sure the coming months will see even more fuel surcharges. My city's transit system is currently debating the biggest ticket increase ever; and that is based on the assumption of $4.00/gallon gas, an assumption that's already proven to be too conservative. Have you seen unusual or unexpected increases in your expenses recently that are explained by the cost of fuel? Do you buy the argument?